The Ides of June when the interstellar debris from comet Enke menaces the planet---we always forget the greatest dangers to humanity aside from ourselves, are celestial. But since we cannot control the stars, the moon or ourselves, we are content to talk about oil and how much we desire this product of geology and dead creatures in the past. Some of whom were killed suddenly by celestial objects. Saudi Arabia is talking down oil this week in an effort to convince everyone, there is no Hubbert Oil Peak and SA is falling down the back slope of this St. Moritz of goo. The G7 celebrate this supposed rescue. I am much more skeptical. (AFP) — OPEC powerhouse Saudi Arabia views skyrocketing oil prices as "abnormally high" and is willing to do what it can to bring them down, visiting UN chief Ban Ki-moon said on Sunday. Media reports have suggested Riyadh plans to raise output next month by about half a million barrels a day to 10 million barrels, a possible sign it is becoming nervous about the political and economic effect of high prices. The Saudis claim to have the biggest oil reserves on earth. But there is no proof of this. The Saudis claim they can flood world oil markets at will like they foolishly did in the past when they tried to kill Iran and Iraq's oil profits. Once upon a time, SA could do this. Once upon a time, they could simply increase output by fiat. Today, this is long gone. 1982 King Fahd visits Saudi Aramco, Dhahran, on Aramco's 50th Anniversary to inaugurate the Exploration and Petroleum Engineering Center (EXPEC), a milestone in the Saudization of the company's operations. 1991 Company plays major role combating Persian Gulf oil spill, the world's largest. 1992 East-West Crude Oil Pipeline capacity is boosted to 5 million barrels (800,000 m³) per day. Saudi Aramco affiliate purchases 35% interest in SsangYong Oil Refining Company (or S-Oil) of the Republic of Korea. 1993 Saudi Aramco takes charge of Kingdom's domestic refining, marketing, distribution and joint-venture refining interests by buying Jeddah-based Saudi Arabian Marketing and Refining Company (SAMAREC). 1994 Maximum sustained crude-oil production capacity is returned to 10 million barrels (1,600,000 m³) per day. Company acquires a 40% equity interest in Petron, largest refiner in the Philippines. Note that in 1994, the oil was being pumped at...10 million barrels a day. And world oil prices were...falling to record lows! Saudi Arabia was flirting with bankruptcy as the wild spending royals ran out of finances. The most likely reason for all the oil that year was because both Saddam and Iran had to pay for past wars and were frantically selling oil. On top of all this, the Soviets collapsed and Yeltsin opened wide the energy production of Russia to looting by the Western powers. The Saudi output has bumped up against the 10 million barrel threshold several times in the past. As recently as the war in Iraq, Gulf War II, the Saudis inched it upwards to almost 11 million barrels a day, but only very briefly. Saudi Arabia has announced an ambitious $70-billion energy investment plan, $18 billion of which will be directed toward increasing upstream petroleum capacity to an estimated 12 million bbl/d by 2009. In December 2006, Saudi Aramco announced its 2007 exploration and drilling budget of almost $4 billion - nearly double the draft budget and full quarter of Aramco’s 2007 capital budget. According to Oil Daily reports, Aramco plans to drill 427 onshore and offshore crude oil development wells in 2007. Approximately 134 wells will be in or near Ghawar, while 85 will be drilled in Khurais, and some 50 drilled in Khursaniya. 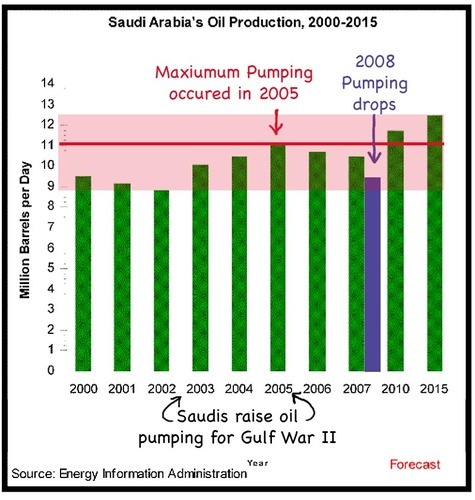 One challenge for the Saudis in achieving their strategic vision to add production capacity is that their existing fields sustain, on average, 6 to 8 percent annual "decline rates” (as reported by PlattsOilgram) in existing fields, meaning that the country needs around 700,000 bbl/d in additional capacity each year just to compensate for natural decline. Aramco estimates that the average total depletion for Saudi oil fields is 29 percent, with Abqaiq (the oldest) 74 percent depleted, the giant Ghawar field having produced 48 percent of its proven reserves and the younger Shaybah just 5 percent depleted. Aramco also claims that, if anything, Saudi oil reserves are underestimated, not overestimated. Some analysts have disputed Aramco's optimistic assessments of Saudi oil reserves and future production. Minister Al-Naimi has vigorously refuted these arguments, and stated that Saudi Arabia could add as much as 200 billion barrels of oil to proven reserves after the extended period of investment and exploration. In order to stave off decline, wells are undergoing reservoir management and rehabilitation projects, including the installation of “smart well” technologies. As per usual, I heavily amended it with my own comments. The faint red bar shows the lows and proposed highs. Note how, in 2002, SA dropped production to below 9 million barrels a day. But from the inception of the Gulf War II until the 'victory' of the US over Saddam who was totally disarmed by the outrageous Security Council conspirators, the pumping rose by nearly 3 million barrels a day. This kept the 'war risk premiums' down. Instead of shooting to over $100 a barrel in 2004, the price of oil was stable or even dropped somewhat. This pumping of oil was temporary. It stressed out the entire SA infrastructure. Instantly, the US and Europe colluded together to expand this war into Iran and beyond. The war against the Palestinian peasants and townspeople increased, too. Saudi Arabia began to make demands concerning control over these events. Which were shoved aside as AIPAC overpowered all of the US political system. Even as the US public has turned sour on wars and high oil prices, the war drums continue to beat louder and louder. Bush was in Europe all this week, banging away like a demented mechanical monkey. The Jewish President of France, instead of cautioning the US on this, has merrily joined in. 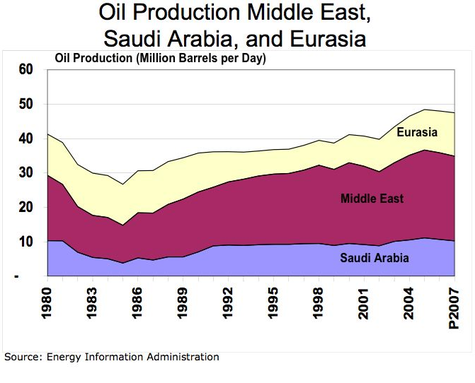 In retaliation, Saudi Arabia continued to drop oil production from 2005 until this year. In between headbanging for more war in Europe, Bush and Cheney have been flying in and out of Saudi Arabia, seeking more oil. In return, each visit, the Saudis solemnly swear they are increasing production and then they CUT IT. The official US graph shows this very clearly! 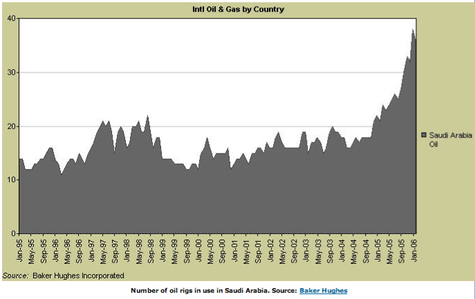 The graph also shows us that the US government takes Saudi assurances of more oil very seriously. This is deluded, stupid and pathetic, all at the same time. First: why should we assume this? The Saudis have reduced or increased oil production on their own basis, not on our desires. We want cheap oil, the cheaper, the better. The Saudis have an obligation to not pump out all their oil. The Iranians are sitting on a huge reservoir of oil which is NOT being madly pumped out of the ground. This is like money in a very nice bank: it increases in value the more the Saudis deplete their own oil banking account. If the US and Europe prevent Iran from selling this precious resource, when the full effects of the Hubbert Oil Peak manifest itself in the near future, Iran will be sitting in a very powerful position. All they need is protectors who can keep the US at bay: China and Russia. This graph clearly shows that the Saudis are now, quite suddenly frantically prospecting for more oil. This is a sure sign that they need to find new well heads or else. This troubles them greatly. Although the corruption of easy money has caused them to slide into moral decay and personal rot, they know about the Hubbert Oil Peak and what will happen to them. As King Faisal noted long ago before being assassinated in 1975, his people would go from camels to cars and back to camels in less than 100 years. He was a fried of my father. He listened to my father talk about the Hubbert Oil Peak and the dire need for Saudi Arabia to develop alternative energy systems like solar and wind energy, both of which are very great in the Desert. The King was also very concerned about the flood of money and how it would corrupt his own family. He was very interested in limiting both. He was aware of the Cave of Death and how infinite money leads to terrible problems just as poverty can destroy a people. But he was not allowed to monitor the flow of oil, it was 'open the spigots and let the money in' time after his death. This graph shows that SA oil production has been mostly flat the last 20 years. Middle Eastern oil has been dropping. This drop off is due to Iran being squeezed by the US and Europe. This squeeze play is irritating the Japanese and Chinese oil consumers but they won't say anything...yet...because they both want to keep flooding the US markets with imports. The US knows this and takes advantage of this. Not that this is good! It simply means, we get high oil prices while getting nothing but lies about what is causing it. Note that this graph clearly shows that Eurasia's oil is not increasing. Indeed, the very sudden and near total collapse of the British North Sea oil fields is at the bottom of the collapse in oil output, aside from the artificial decrease caused by US/UK/EU colonial projects in the Middle East. By the way, the Iraqis who are negotiating with the US over our 'defense' of Iraq are playing increasing hard ball games. They know that if they cut their own oil production, prices will soar very high indeed. Unlike Saudi royals, they have no dogs to hunt in the US/UK/EU economies. If these economies collapse, they won't shed a tear. I suspect, they would celebrate. The Shi'ites know that Time Is On Their Side. They know the US and its minions plan to bomb, bomb, bomb Shi'ites in Lebanon, Syria, Iraq and Iran. They know the Saudis want to bomb, bomb, bomb them too. But they also know that they, not the Saudis, control world oil prices. The Shi'as can crater the entire planet's financial systems if they so wish. And they are very tempted. Further when the CERA list on which it appears was reviewed here in Sept 05, Interloafer quoted Matt Simmons in expressing some cynicism about Aramco ability to sustain the higher levels of production projected for these fields. Peter Jackson, of CERA, disagrees (pdf file) The project currently appears to be on schedule. Now it should be born in mind that the Saudi Strategic Energy Initiative is to have enough spare capacity to be able, by June of this year, to replace Iran’s production, should there be a problem. And, for this reason, it is perhaps a little presumptive to assume that they are currently producing at a maximum level. However, it should be noted that this also assumes that the three-field increased production will be on line by that time. As noted above, it now appears that it will be later in the year before this happens. Musing about these numbers, what struck me was that we are now seeing increments in production coming from multiple fields rather than just further development of a single one. After the first new increment for Shaybah comes on line, work for which is now underway, (but which may now be only 200,000 bd by April of 2008, with another 300,000 bd being added by 2010) the next development, Khurais, is also going to be a three-field project . It will also include the Abu Jifan and Mazalij fields, and will need injection of an additional 4.5 mbd of treated water into those fields to achieve that production level. This graph has quite different data from the official Energy Department's graphs! And who do we trust? The lying bastards who run our government? Or anyone else? I happen to think that the good people running The Oil Drum have a much better track record for honesty and careful analysis. Not that the amount of oil pumped NEVER exceeded 10 million barrels a day! And I happen to subscribe to this number, too. And it trails off starting in 2006 which coincides with the end of the housing bubble. This graph shows how the price of oil began its steep climb as the Saudi fields pumped slightly less oil. But of course, this climb is more due to hoarding of oil as the G7 nations prepare for Gulf War III as they push the envelope. The price climb has been much steeper starting in April for the simple reason, the US public has sat idle as the last three candidates for President vied with 'who is the worst war criminal' award. Far from expressing rage over a past war, there is indifference about a future war. This is entirely due to the media that muffled or outright lied about the real anti-war candidates. Kucinich, my personal favorite, recently read off the charges of impeachment in the House which was rapidly buried in committee. This startling attempt at forcing the government to face reality was virtually totally ignored by the warmongers who own most of our media and who dream of dominating the Middle East and wiping out the Palestinian people. The oil we want from Saudi Arabia is really human blood. We don't think about it this way because we don't want to have this charged against us. But it is the truth. The US public could take note of what is going on in DC just like they can see for themselves that the media is lying about nearly everything. But seeking information is hazardous because the online community if full of liars, con artists and fakers who want to mislead or misdirect people. They join the mainstream in this effort at delusional deception. It is very hard to hack through all of this. We can only apply ourselves to look at the hard facts and to see when there are NO hard facts, only suppositions. In the case of the super-secretive Saudis, we can only guess beforehand. But we know from the past, what is possible. The idea that they can easily add 3 million more barrels WHILE keeping up present rates from older wells is PURE INSANITY. The old saying, 'Don't count your eggs before they hatch' are very true here. If we goof off hoping for this bonanza, we will be in very dire straits when it doesn't happen. Aside from the other uncertainties about war. Namely, that Saudi Arabia can protect its wells, the transportation systems, the Gulf of Hormuz all at the same time, 100%, as Iran is attacked by Israel and the US---THIS IS PURE INSANITY. When Big Brown cracked his hoof before the final race of the Triple Crown, us horse owners shook our heads in dismay. We knew this horse was finished at barely 3 years of age and would probably have to be put down. Instead, the poor thing was raced and limped in dead last. Yet thousands of fools betted on him. Stupidly. As the owner and the media lied about the probability of the horse even making one circuit around the track! They lie all the time. They know they are lying which makes this worse. They need bettors to be fools. Just as they are treated by Goldman Sachs and JP Morgan. A fool has to be born every minute so they can be fooled. Fool me once, shame on you, fool me twice, own the media. 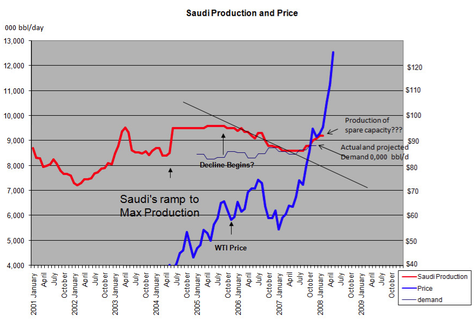 Saudi Arabia’s Crude Oil Reserves: Particulars or Propaganda? "I do not fear poverty for you but your riches"
Great wealth is indeed very dangerous. It destroys the soul from within. Unless one figures out how to turn the tables! This means sharing the wealth with others in a noble way, not on palace building or power tripping. A delicate matter, that is! A very delicate matter. Many lottery winners go right off the cliff. Many end up bankrupt. Ditto with people who inherit a lot of loot. I have seen this close up, very close up. I think history is pretty much 100% conclusive that given power, people ALWAYS end up believing they are gods. And then begin the descent into looting and killing their subjects with impunity. And yet we continue to give people enormous power. We need to get back to the 10 amendment and local rule. Anyone who suggests consolidating power ala Lisbon Treaty, OPEC, Federal Government, Federal Reserve, World anything, etc should be jail for insanity. History is absolute on this. For me what confirms your argument on what the Saudis can deliver, who is making the promises. It is only (highly-paid)flunkeys and minions who make the promises. These promises are not worth spit until one of the Royal Family makes publicly promises it. When I used the search terms "king saudi arabia promises more oil" on Google, this page was at the top of the list, congrats Elaine. Yes, only when the King himself says something, it STILL can be a lie! They think nothing about lying to 'Crusaders' which is what they call us. Actually, the also call us 'Infidels' and think we are way outside of the circle of goodness that is Islam. So we take what they say with a huge grain of salt the size of a mountain. Please tell us your opinion about LS9.com. Talk about the goals of this company in the next post about energy, ok ? So LS9 basically creates new bacterial life forms to make petroleum. What could POSSIBLY go wrong? Wouldn't it be cool if it could turn any carbon source, like a carbon-based life form, into fuel? How many private jets could you fuel from the carbon in the 5 billion people they plan to depopulate? Hey, It is probably going to make Gasoline so cheap you won't have to meter it! Just like NUCLEAR ENERGY in the 1970S!!! Dial your Nokia 6680 1-800-GET-CLUE. In some cases, LS9’s researchers used standard recombinant DNA techniques to insert genes into the microbes. In other cases, they redesigned known genes with a computer and synthesized them. The resulting modified bacteria make and excrete hydrocarbon molecules that are the length and molecular structure the company desires.